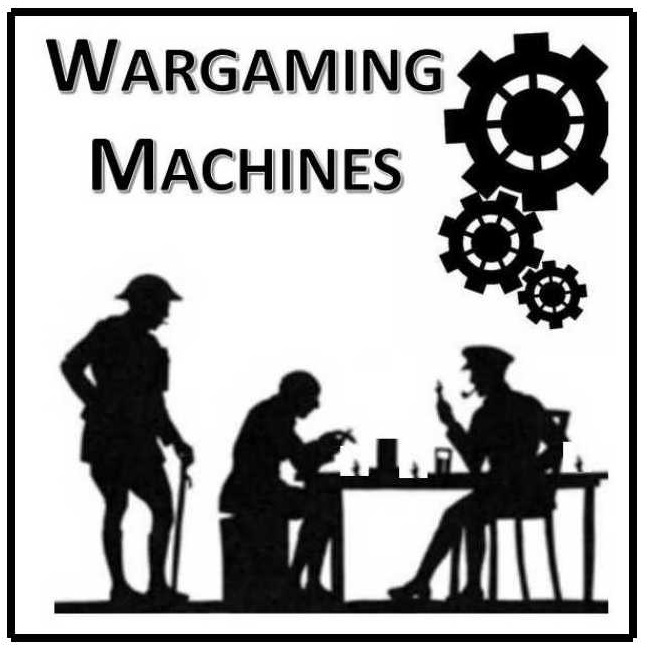 This scenario is designed to provide a short introductory game for those wishing to try the system. The Battle of Spicheren took place on 6 August, 1870 along the Saar during the initial Prussian advance into France, shortly after the French defeat at Wissembourg and on the same day as the Battle of Wörth. Although exhibiting the French failure of reconnaisance, communications, and initiative which plagued them throughout the conflict, the French still offered a real challenge to the Prussians. Moltke did not intend for the battle to occur - it was caused by the over-zealous Steinmetz, whose troops found the crossing of the Saar at Saarbrucken unguarded, and pushed forward against what was assumed to be the rear-guard of the retreating French. Frossard, commander of the French 2nd Corps, had established a defensive position just beyond Saarbrucken, and had sent for reenforcements - had it not been for confusion and a lack of initiative (not to say competence) on the part of French commanders, the Prussians would have found themselves in desperate shape. The reenforcements, although ordered in support, never arrived. As it was, the Prussians had a difficult time of it. Units from several corps crossed the river at Saarbrucken during the battle, attracted by the sound of the guns and joining an engagement which had not been intended by the high command. The French held their positions until after dark, and withdrew overnight, conceding the field and abandoning the supply depot at Forbach to their foes. It was not, however, the coordinated attack which Moltke had been planning, nor the Prussian victory it might have been. The challenge facing the Prussians is a significant one: the French have established a very strong position, and frontal assaults are likely to fail. This was one of the central problems facing the Prussians during the war: how to dislodge a French force which has taken up a "position magnifique," and is prepared to use the chassepôt to advantage. All units on both sides are Line Infantry or Line Cavalry of their respective nations, excepting, of course, the artillery reserves. The 5th Cavalry was made up of a mix of uhlan, cuirassier, dragoon, and hussar regiments, so any of these figures are appropriate. The French cavalry was made up of chasseurs and dragoons in equal parts. Prussian generals will set-up/arrive with any unit in their corps, but may exercise command influence over any Prussian forces once on the table. The map shows a 2 foot-by-3 foot table with the top edge being north. The rail line functions exactly like a normal road, as it represents a cut through the forest and other terrain. All hills and woods are rough terrain, and will provide soft cover, except the hills directly southwest of Saarbrucken, which are open. The towns and villages are not fortified, and will only provide soft cover. The Prussian 14th Division, 5th Cavalry Division, and the VII Corps Artillery Reserve may set up in Saarbrucken, or anywhere within 6 inches of it, in maneuver or march formation. The 13th Division will march or maneuver onto the northwest corner of the table on the first turn or any turn thereafter. 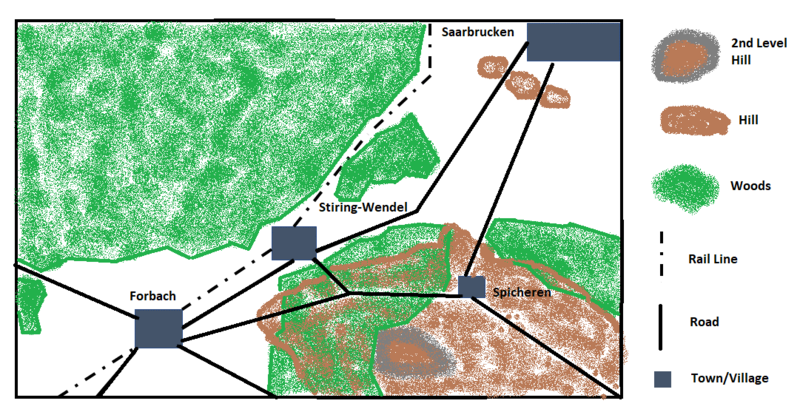 5th Division and 16th Division will enter the table in Saarbrucken on the second and third turns or later, in any order preferred, but with no more than one unit entering per turn, again in march or maneuver formation. The game starts at 11:00 AM, and continues until 11:00 PM, a duration of 12 turns. Either side may concede at any time, but will suffer (at a minimum) a marginal defeat in consequence. The Prussians win a decisive victory if they destroy 3 or more French units. They win a marginal victory if they have troops in Forbach and Stiring-Wendel at the end of the game, or were the last to occupy them. The French win a marginal victory if they deny victory to the Prussians, and a decisive victory if they destroy three or more Prussian units while doing so. The Prussians are potentially exposed to an early onslaught from the French at the start of the game. Historically, von Kamecke, commanding the 14th Division, pushed forward quickly and on a broad front, an over-reach which kept the French occupied in their initial positions while other Prussian units moved up, but also had negative effects on the command and control situation during the battle, as his units were spread on too wide a front. The French made only local counter-attacks during the battle, none of them decisive, and none in strength. There was a great deal of back-and-forth fighting in the woods around Stiring-Wendel. The French position on the heights around Spicheren was another focus of Prussian effort. While partially conceded, the French position was not taken by the Prussians during the battle, proving to be a strong one. French players would be wise to imitate Frossard in deploying here if taking a defensive stance. As in many of the battles of the Franco-Prussian War, the Prussian artillery proved to be a critical factor, blunting the French counter-attacks and allowing the heights around Spicheren to be assaulted throughout the day. The same will be true in this scenario - an enemy deployed in a strong position is likely to defy any frontal attack which is not thoroughly softened-up by artillery bombardment. Copyright (c) 2018 by Arofan Gregory. All rights reserved.